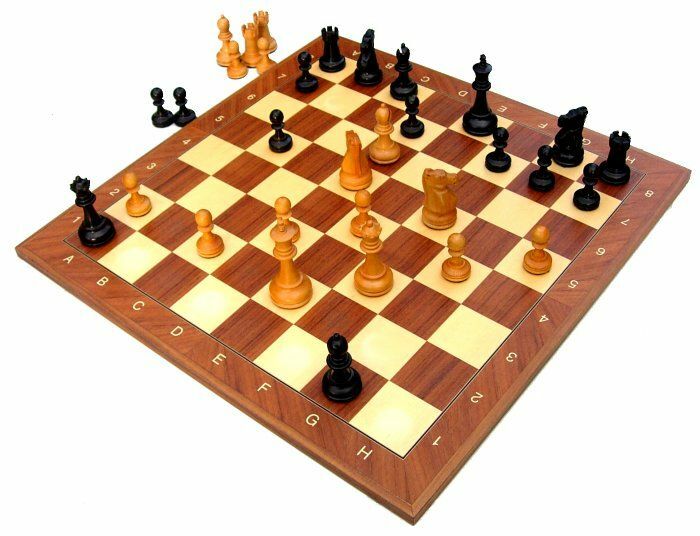 Chess is a two-player, abstract strategy board game that represents medieval warfare on an 8x8 board with alternating light and dark squares. Opposing pieces, traditionally designated White and Black, are initially lined up on either side. Each type of piece has a unique form of movement and capturing occurs when a piece, via its movement, occupies the square of an opposing piece. Players take turns moving one of their pieces in an attempt to capture, attack, defend, or develop their positions. Chess games can end in checkmate, resignation, or one of several types of draws. Chess is one of the most popular games in the world, played by millions of people worldwide at home, in clubs, online, by correspondence, and in tournaments. Between two highly skilled players, chess can be a beautiful thing to watch, and a game can provide great entertainment even for novices. There is also a large literature of books and periodicals about chess, typically featuring games and commentary by chess masters. The current form of the game emerged in Southern Europe during the second half of the 15th century after evolving from a similar, much older game of Indian origin. The tradition of organized competitive chess began in the 16th century. The first official World Chess Champion, Wilhelm Steinitz, claimed his title in 1886. The current World Champion is Magnus Carlsen, Norway. Chess is also a recognized sport of the International Olympic Committee.